Happy Thanksgiving! We hope you are enjoying friends, family, a few days off, and lots of delicious food! This year we have been continually blown away by how amazing the Chattanooga running community is. From races to Monday track workouts, we love working and running with all of our Fast Break friends. It makes our day when a familiar face pops into the store to give us a race report, or a long time customer picks up a new version of shoe, or a new runners presents us with a foot issue to solve. If it weren't for the local, familiar faces, our job would be boring. So this Saturday, we are throwing a little party at the store to say thank you. We're calling it the CUSTOMER APPRECIATION CELEBRATION! We will be opening at 10 am with FREE pancakes, waffles, and Milk & Honey coffee!!! So bring the kiddos, your running buddy, and even your dog, and come hang out with us on Saturday morning. There will be special sales throughout the store, on both apparel and shoes, to kick-start your Christmas shopping! Speaking of Christmas, we put together a little gift guide to help outfit your favorite runners with gear they will love (and won't break the bank). Every runner could use fuel for their long runs (or deodorizers for their clothes and shoes afterwards!). Or warm their cold toes with Injinji toe socks (they work great with sandals). These gifts make great stocking stuffers or a perfect inexpensive token of appreciation to a friend. Keep your runner safe with a headlamp for the trails or a flashing light for the streets. Provide some warmth with a hat or gloves. Of course, you could rep your local running store with our new Fast Break trucker hat. For that special woman who deserves a little more, stock her closet with a stylish, comfortable new outfit for running this winter. Functional, durable, and good looking. What else could he ask for? 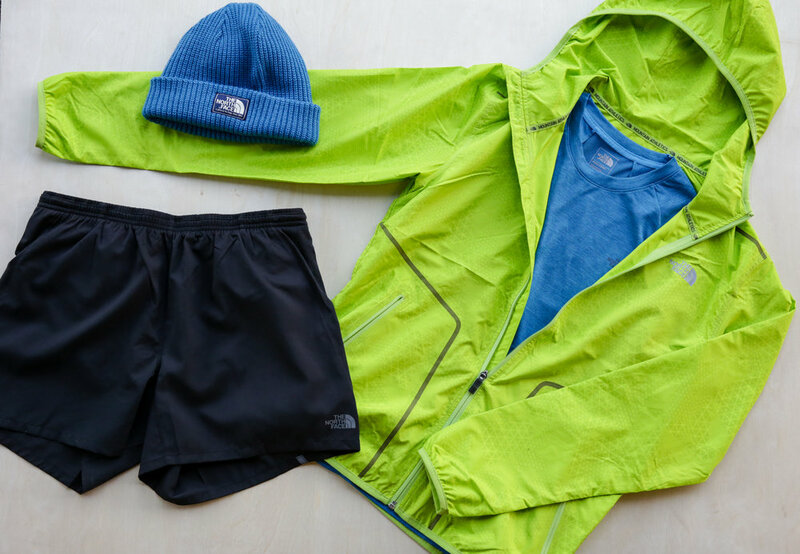 Light weight and perfect for a fall weather, that special guy will love this gear combo for his next run. Enjoy your Thanksgiving and we will see your for pancakes, waffles, and coffee on Saturday at the store! How to Warm Up... Like a BOSS. Whether it's high school track, marathon training, or 80's aerobic videos... we've all read somewhere to stretch long and hard before we workout. Well, stop. STOP. IT. Why? I'm glad you asked, my friend. Long-hold stretches may lengthen a muscle and increase flexibility, however stretching also reduces muscle function due to loss of power. A really smart doctor told the New York Times that a stretched muscle becomes less responsive and weakened for up to 30 minutes after stretching. That's not how you want to begin a run! So what do I do now?!! Warm up correctly. Loosen muscles and tendons to increase mobility and literally warm up the body. To help you get started, we put together a few warm up drills that you can perform before you run, walk, dance, flip, or fly (please don't actually try flying). These drills will make your muscles fire and increase strength and mobility in your stabilizers. Fastbreak owner Alan's advice is to walk, shuffle, run, move for up to 10 minutes to get your heart rate up and blood pumping. Then perform the following dynamic moves at least 2 times for 30-50 meters. Balance yourself against a wall or fence with one arm. Start with both feet under your hips. Swing the inside leg forward then then swing it backwards. Gradually increase the height of your leg swings. Swing 10-15 times then switch sides. Make it more fun by imagining you're in the nutcracker ballet. Face a wall or inanimate object (so not your dog), and brace yourself with your arms outstretched and shoulder-height. Swing one leg to the side of your body then swing it across the body to the other side. Increase the range of motion with each swing. Perform 10-15 reps then switch legs. Remember skipping as a kid? Well turns out it's good for you. Start by walking through this move then advance to skipping. Lift your knee to waist height and keep you back leg straight as you come off your toe. Alternate legs as you move forward. Strike the ground with your forefoot. Swing your opposite arm with you lead leg in a running motion. Too easy? Whistle while you skip. Perform the same move as the A Skip except extend your shin/lower leg when you raise your knee. The extension dynamically stretches the hamstrings. Emphasize the backward pawing motion as your foot strikes the ground and pulls through. Get into a rhythm by listening to the sound of your feet. Swing your arms in a running motion. Skip side to side by bringing your feet together then shoulder width apart. Swing your arms to cross in front of your body then up and over your head. Fast Break employee Varina calls these "fairies" (we don't know why), so wiggle your fingers like you're shooting out fairy dust to make you a better runner. Start by standing upright and facing forward. Move laterally to the right by placing your left leg in front of your right leg. Then move the right leg to the right and place the left leg in front again. Maintain a fluid motion with your arms rotating in the opposite direction from your legs. Travel 50 meters then go to the left, facing the same direction. Too easy? Sing it out loud for Marvin Gaye! Try to replicate your forward running motion, but backwards. Push off your forefoot and pump your arms. You're lunging with your hamstring and making your core muscles stabilize. Focus on form, not on speed. It will feel awkward at first. If you're not super coordinated possibly wrap pillows all around your body. There is LOTS information on stretching (or not) and drills that improve your mobility, strength, and fire up the engine before you run. We've included a few links with different perspectives to start your research. Have fun and go for a run!